Case 2: 30 year old gentleman who had undergone surgery that resulted in an overly feminized, scooped nasal bridge and internal as well as external valve collapse. Irradiated rib cartilage not only helped restore a stronger profile and aesthetic, but also corrected all the breathing problems. Case 3: This 24 year old gentleman, like case #2, required irradiated rib cartilage for his revision. In this case the revision allowed for lengthening of his previously over-shortened nose, restoration of a strong masculine profile as well as a host of functional breathing problems. Case 4: This woman had had her septum and tip severely over-shortened during a previous surgery, leaving her with a very unnatural looking distorted tip structure. She was very frightened for a long time at the prospect of touching her nose again. 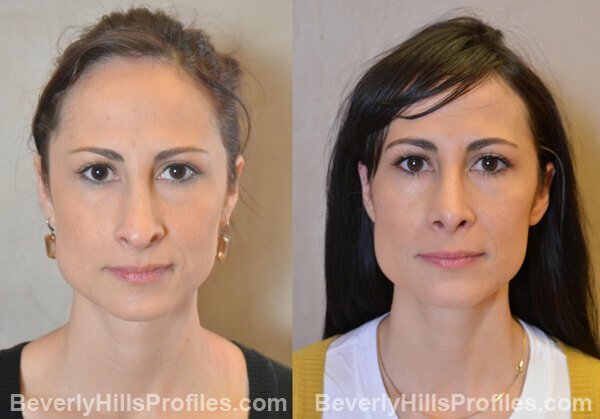 Increasing nasal length in these situations is one of the hardest things to accomplish in revision rhinoplasty but, through use of irradiated rib cartilage, she was able to achieve a beautiful, natural result with restoration of healthy breathing. Case 5: 51 year old gentleman presented after 3 prior surgeries with severer nasal obstruction, bilateral internal and external valve collapse as well as a host of aesthetic concerns. Irradiated rib cartilage allowed for repair of the breathing as well as aesthetic concerns which have remained stable even 3 years later. Case 6: In revision Rhinoplasty, we must contend with all sorts of challenges, the hardest of which can be problems with the nasal skin. This young woman suffered an infection following her previous surgery resulting in an excessive amount of scar tissue and loss of cartilage support. 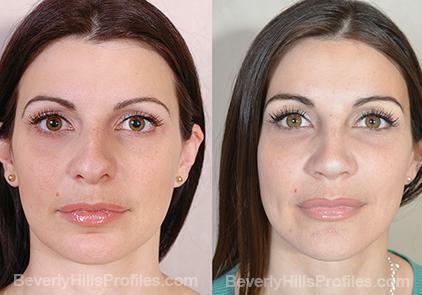 She wanted to improve the shortened, rounded, and ill-defined appearance of her nose. 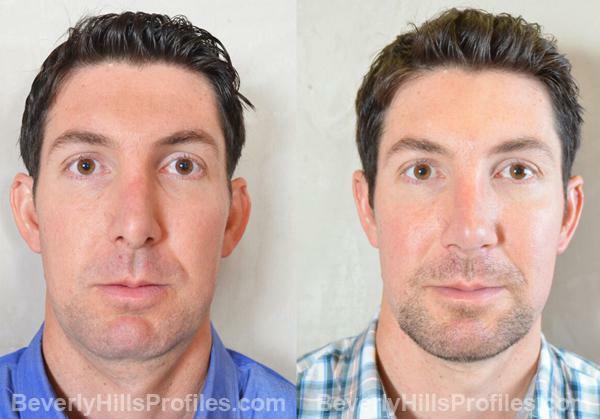 In these 6 month photos, her nose is more refined and balanced, and the collapse of her nasal airway has been corrected. 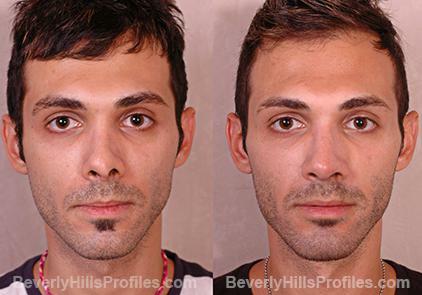 Case 7: This is an example of a patient who had asked for a subtle change from her previous rhinoplasty and later wished she hadn’t because she ended up with a nose that still didn’t fit. Her bridge was too wide and a little high throughout. Her tip was a little full and droopy, making her nose look too long for her face. Her Profiles revision centered around correcting these issues along with some residual asymmetries to produce a change that is at once both defined and feminine. 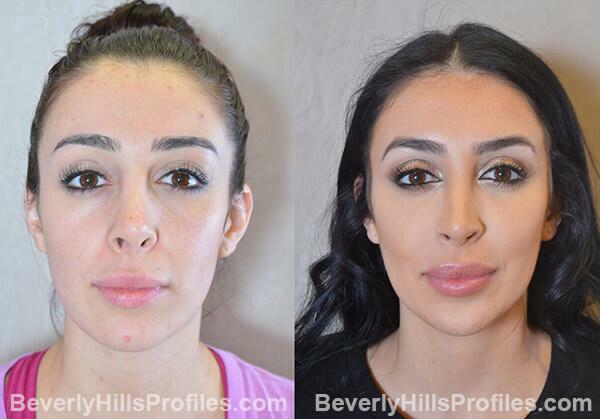 Her new nose suits her features so well that her eyes just jump off the page in the after photo. Case 8: Despite previous surgery, this woman’s nose remained crooked, overprojected, hanging, and collapsing in the mid-vault. 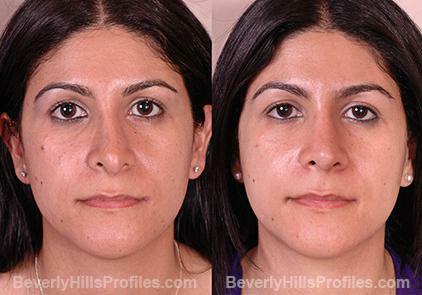 A tip cartilage overlay was performed to deproject her tip and correct the hanging columella and excess nostril show. In addition, the bones were smoothened and brought together, and the valve collapse was repaired. Her new nose now suits her features much better, allowing them to really shine through while her nose goes unnoticed. Case 9: This patient had severe tip bossae (knuckling) and irregularities along the bridge of her nose from a previous rhinoplasty along with significant breathing difficulty. 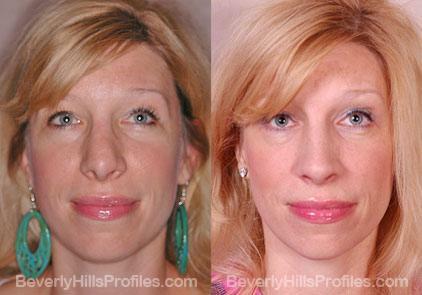 She wanted her nose to be smooth and natural looking without being obvious that she’d had a rhinoplasty. Revision in her case required use of rib cartilage for support. In these six month photos, there’s still a little swelling but her goals have clearly been accomplished and she couldn’t be happier. Case 10: Previous rhinoplasty had left this patient with an unstable, droopy tip and mid-vault collapse with breathing problems. Correction of these issues required tip reconstruction, bilateral spreader grafts, and a graft over her bridge for smoothening of her bridge line. 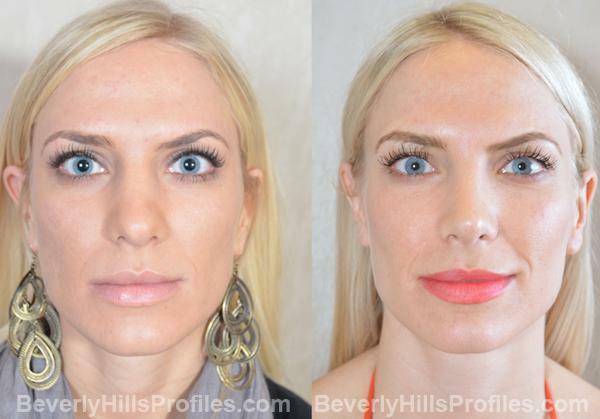 And, if the revision rhinoplasty alone weren’t enough to make her look younger, an upper lid blepharoplasty removed some of the extra skin above her eyes to further brighten and soften her look. 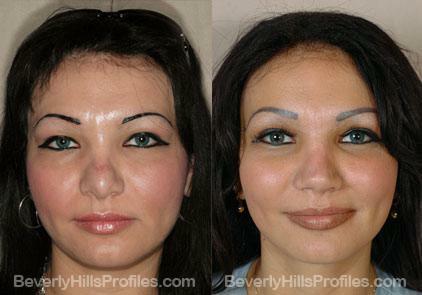 Case 11: This patient had had a previous rhinoplasty but felt her tip was still bulbous and undefined. Creating real structure in combination with effective management of skin thickness allowed her to achieve real definition. 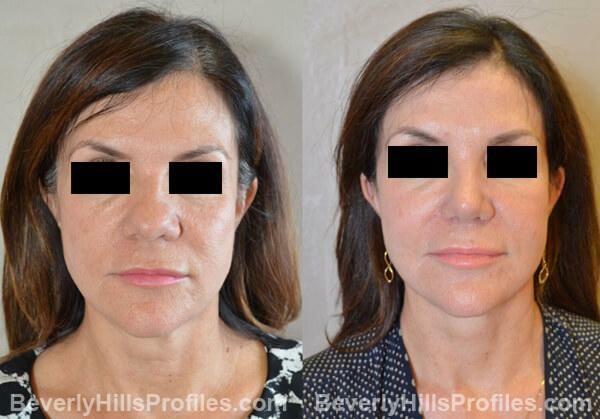 At the same time, a mini face and neck lift was able to substantially improve neck and lower face laxity with enhancement of cheek volume and skin draping. 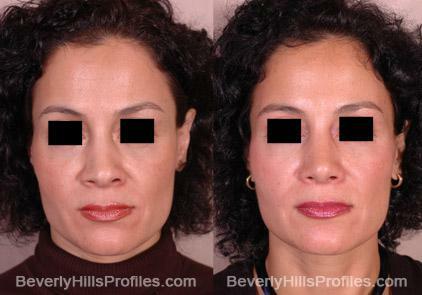 Case 12: Previous rhinoplasty had created tip and nostril asymmetry and left this woman feeling wide and flared at the base of her nose. The goals of revision were to straighten the nose and to improve tip symmetry and support while reducing nostril width and rounding. The addition of fat transfer to the cheek and under eye area also helps to provide an overall more youthful and harmonious aesthetic. Case 13: In this patient, an existing rib graft over the nasal bridge was left alone. Even though it was a little crooked, she was more bothered by her tip and so, surgery was limited to correction of the tip asymmetry. This required additional irradiated donor rib cartilage grafting to increase length and help repair the tip collapse on the left. Reprojection and definition of the tip improved the overall nasal contour. Case 14: Revision rhinoplasty comes in all forms. In this case, over-reduction of the nasal bridge without proper tip adjustment, had created a pollybeak appearance. By re-supporting and defining the tip a more refined, natural appearance can be created. A subtle narrowing of the nostril flare helped put the finishing touches while still preserving the natural alar contours. Case 15: 30 year old had previous surgery which left her crooked, unable to breathe and with a droopy tip. 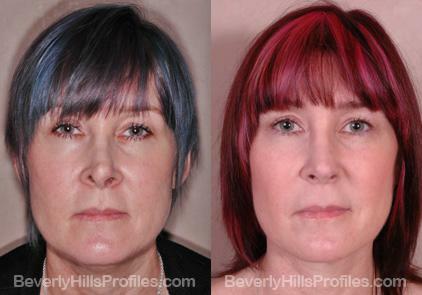 Revision surgery straightened her nose, corrected her breathing and restored a natural nose. Case 16: A rhinoplasty that concentrates on making a nose smaller by removing a lot of cartilage can sometimes have the opposite effect. 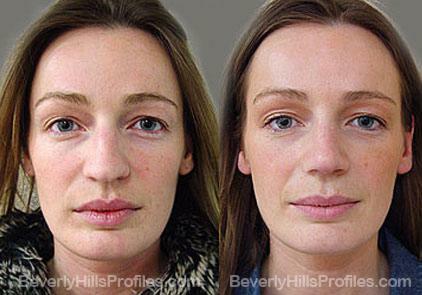 In this case, the space filled in with scar tissue leaving a wide, rounded, bulky nose that was generally lacking in definition. 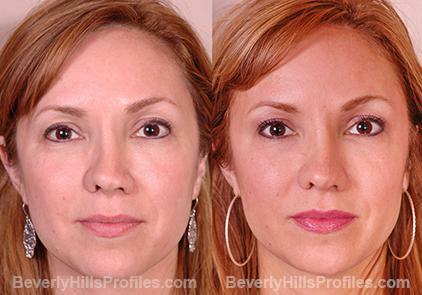 A successful revision required removal of scar tissue and re-supporting of the tip to create a narrower, refined look that still harmonizes with other facial features. Case 17: This 30 year old was unhappy with her tip asymmetry and crookedness from a previous procedure. 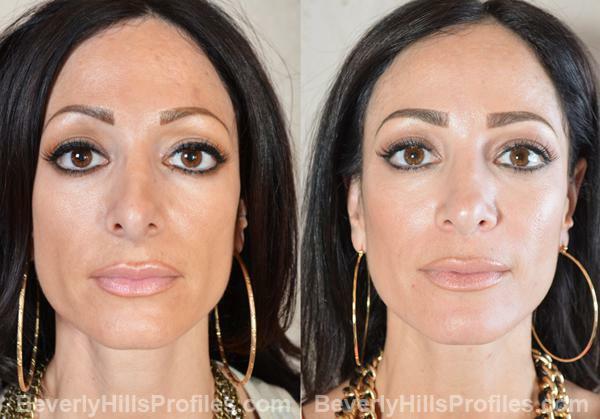 This was corrected along with a septal extension to reduce her tip rounding and an asymmetric nostril reduction. Case 18: This beautiful former model suffered tip collapse and a septal perforation following previous septoplasty done elsewhere. 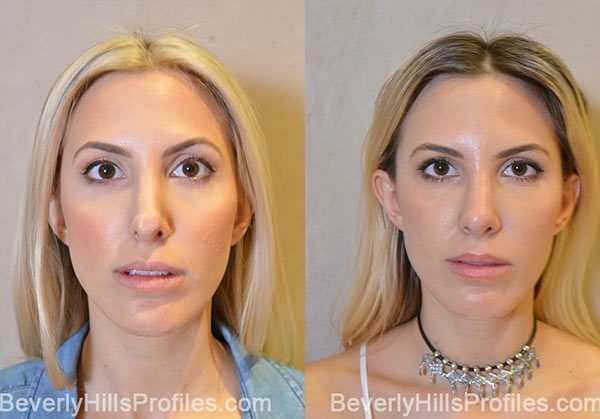 After being told she couldn’t be helped by a number of other plastic surgeons, at PROFILES we proceeded to tailor a revision rhinoplasty that restored her tip to its natural height that balanced her elegant tall frame. 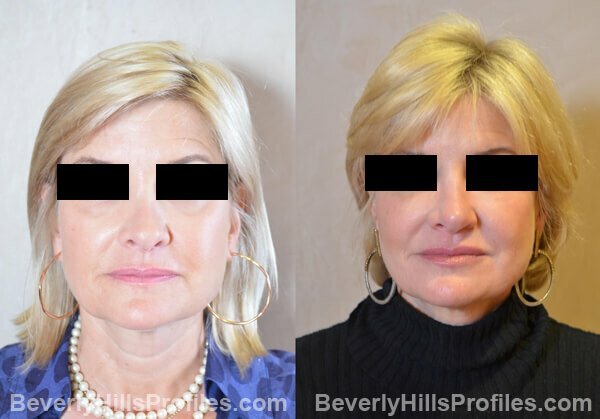 Case 19: This one we title, “It’s never too late!” Rhinoplasty done many years ago had resulted in progressive nasal twisting and collapse over time for this young woman. She had often thought of fixing it but was afraid of another disappointment. 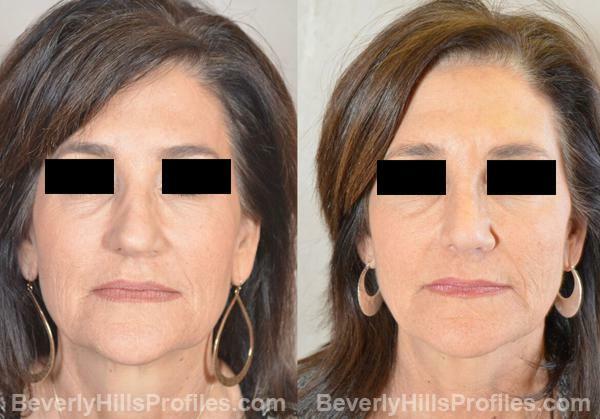 Her PROFILES Beverly Hills Revision Rhinoplasty not only completely restored a beautiful, natural look, but she came in excited to tell us that after so many years she could finally smell Challah bread again. Case 20: Injuries or fractures of the nose can lead not only to a crooked appearance but also to loss of tip support and severely compromised breathing. 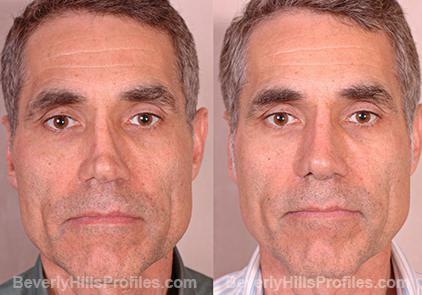 Functional rhinoplasty in these cases focuses on identifying and correcting all causes of nasal asymmetry while restoring support to the tip and mid-vault (middle part of the nose) so that the nose not only functions well but looks good too. Case 21: A high deviation of the septum caused this patient to have a failed previous attempt at straightening done elsewhere. These are more challenging cases to get straight and this young woman required a septal reconstruction with grafting in order to re-support her bridge and tip. Reduction of rounding and tip drop helped to complete the aesthetic improvements. Case 22: After multiple nasal fractures, corrective surgery elsewhere had failed to repair this young woman’s collapse and breathing issues. At the same time, trimming of her tip cartilages had caused knuckling and irregularities on her bottom view. Reprojection of her tip was important to creating a straight profile. 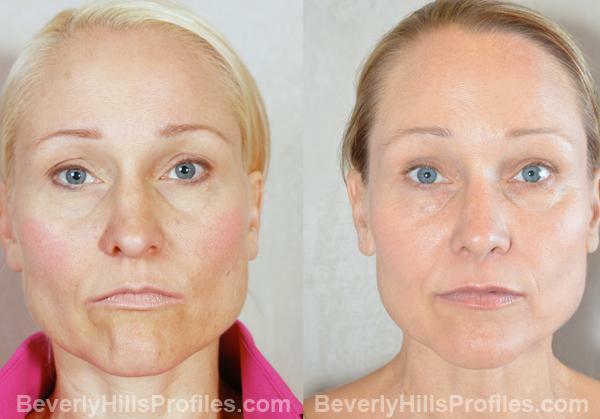 While she is still swollen in these after photos, improvements in contour can already be seen and even greater definition will be seen with time. Case 23: This patient had a previous nasal fracture with a hump and breathing difficulty. Her functional obstruction was addressed along with straightening of her profile and finesse tip refinement. Improvements in contour can be seen even with the little bit of tip swelling. Case 24: This young lady had 2 previous surgeries which had resulted in an overly shortened nose full of scar and breathing problems. He ? views show an amazing transformative change in tip definition and increased length along with her significantly improved breathing. 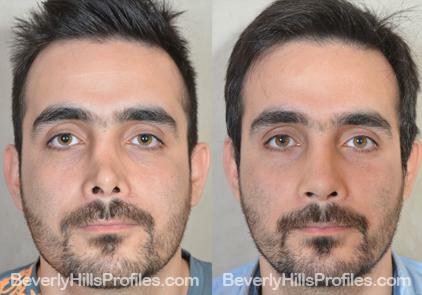 Case 25: Ethnic rhinoplasty or Hispanic rhinoplasty when not done properly can result long term in an overly-shortened, scooped out, pinched, upturned nose that is emasculating and, perhaps most importantly, results in near total nasal obstruction. 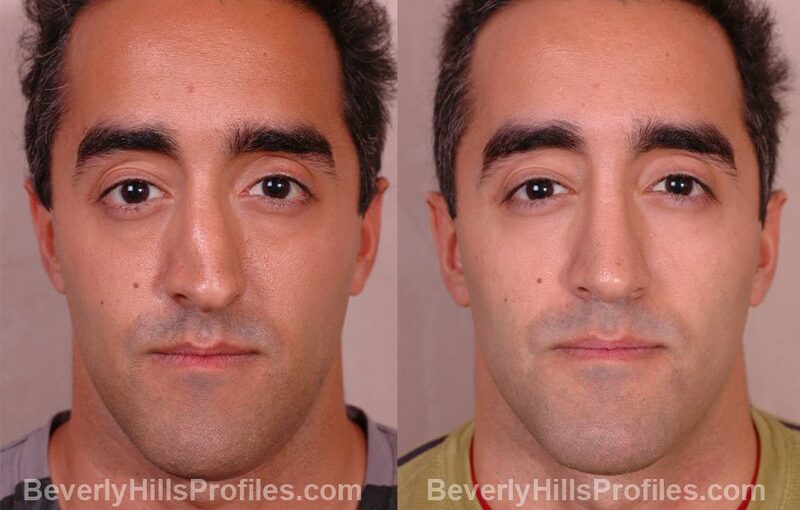 Los Angeles Revision Rhinoplasty can restore breathing as well as a natural, appearing masculine nose even in thick skinned, ethnic patients. Case 26: This young woman suffered a serious nasal and facial injury from an accident affecting her nose, left eye, and causing multiple facial scars. Previous surgery had been unable to straighten her nasal collapse. After reconstructing missing bone and cartilage on her entire left nasal sidewall, she was able to achieve restoration of nasal symmetry and much improved breathing. On the base view, you can also see substantial correction of her columellar scarring. 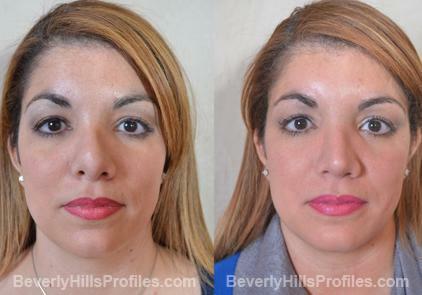 Case 27: This woman had a previous rhinoplasty that left her with a scarred, undefined nose with very poor support. She was also noticing a feeling of increasing heaviness of the brows and upper lids that was making her look older. 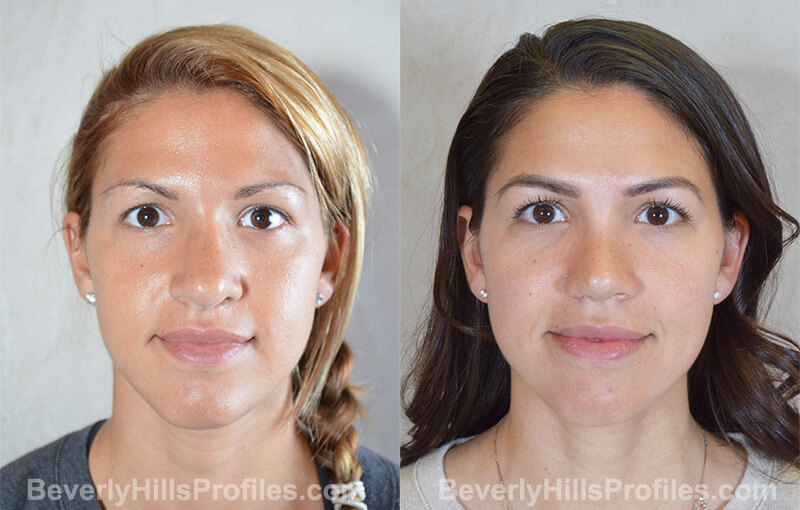 Revision rhinoplasty at Profiles using irradiated rib cartilage allowed us to significantly improve her nasal contour by reducing size and increasing definition while improving breathing at the same time. 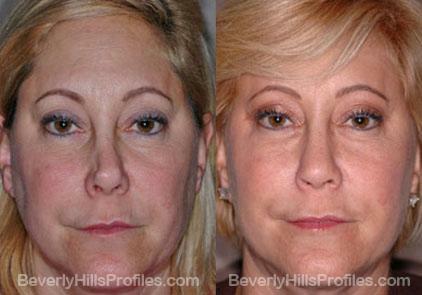 A trichophytic brow lift raised her brows to a more youthful position and opened up her eyes. Note how the incision at the hairline allows hair to grow through the scar to make the incision completely inconspicuous. Case 28: Typical results of an over-aggressive rhinoplasty can be seen here wherein the tip cartilages have become more vertical in orientation, causing a pinched appearance and hanging columella. Revision rhinoplasty involved tip reconstruction with batten grafts and repair of valve collapse. The bridge line was also smoothened and straightened. 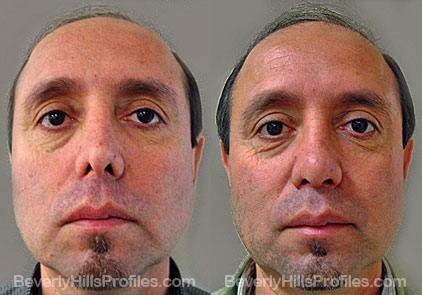 In addition, bilateral Otoplasty brought his ears into a vertical plane to make them far less noticeable on front view. Case 29: This patient’s previous rhinoplasty had left her with irregular nasal bones, nasal valve collapse, and tip bossae leading to significant tip asymmetry that is seen well on her base view. 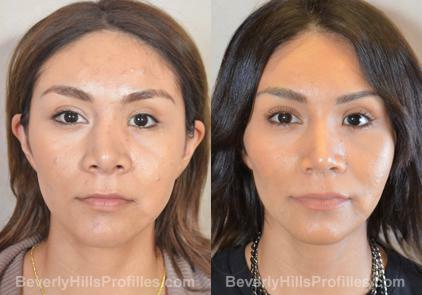 Correction of these issues left her with a nose that not only functioned much better but eliminated the irregularities and asymmetries that brought unwanted attention to her nose. She’s very pleased with her much more harmonious nasal profile. Case 30: Subtle refinement was the key goal for this patient. A minor rhinoplasty revision to reduce a slight bump and hook to the profile was coupled with a mini face lift to correct early jowling with restoration of neck and jawline definition. 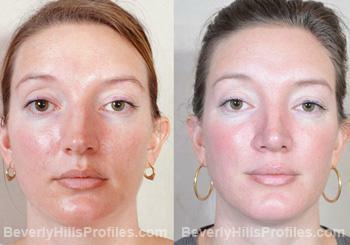 Case 31: This patient had had a previous rhinoplasty but felt her tip was still bulbous and undefined. 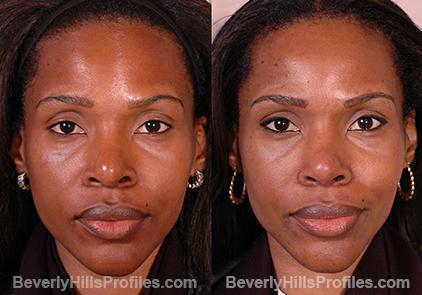 Creating real structure in combination with effective management of skin thickness allowed her to achieve real definition. 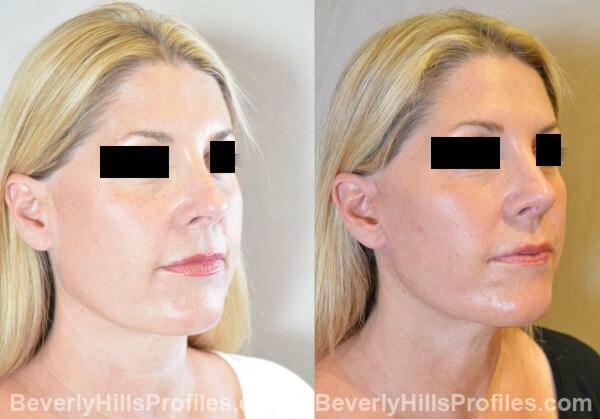 At the same time, a mini face and neck lift was able to substantially improve neck and lower face laxity with enhancement of cheek volume and skin draping. Case 32: This young woman was unsatisfied with a previous rhinoplasty result that had left her tip feeling too long and droopy. Vertical displacement of her tip cartilages were causing her to have a persistently bulbous tip with excessive columellar show. 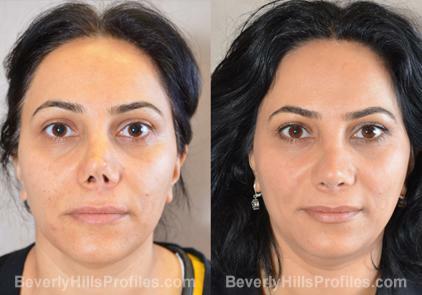 These six-month revision photos after tip repositioning and nostril flare reduction reveal a much more balanced nasal contour that suits her slight features. Case 33: A serious injury to the nose had caused this patient to have severe bone loss and internal valve collapse with pinching of her mid-vault seen on frontal and three-quarter views. She is now 1.5 years after repair with bilateral spreader grafts, reconstruction of her septum, minor tip revision, and soft tissue augmentation of her bridge. 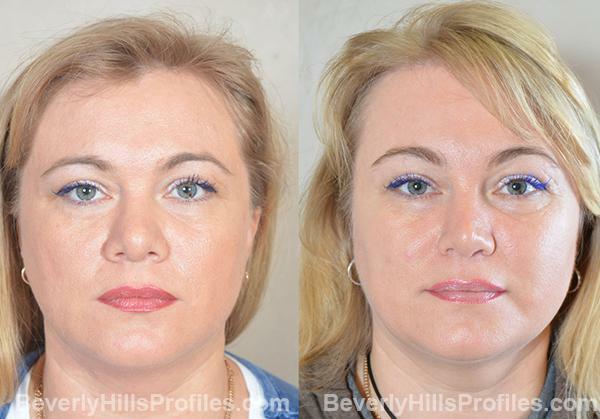 She’s had full functional restoration of her nasal breathing and she couldn’t be happier with the aesthetic improvement. 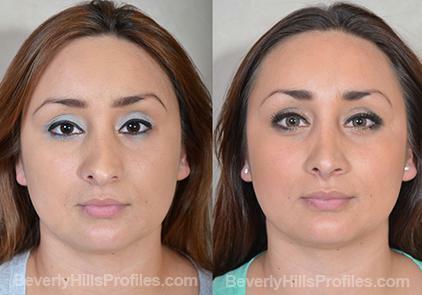 Case 34: Previous rhinoplasty had left this patient’s nose crooked, wide, droopy and undefined. She wanted a shorter, more elegant, and more feminine look that matched the rest of her appearance. Revision surgery involved tip cartilage overlay, bony and tip narrowing, and grafting to resolve her significant breathing issues as can be seen on the base view. She’s doing very well after one year is happy to have finally achieved her goals. Case 35: Previous surgery had created an open roof deformity, with crooked nasal bones, mid-vault collapse and a severely twisted tip with nostril retraction. She didn’t mind her profile but wanted to be straight and smooth, and be able to breathe again. We needed rib cartilage to replace her missing septum, most of her tip cartilage, and to place spreader grafts to correct her restricted breathing. She now has the nose she always wanted and is excited that it will stay that way. Case 36: This patient had developed a lot of scar tissue after 2 previous rhinoplasties and felt her nose was too big for her face. 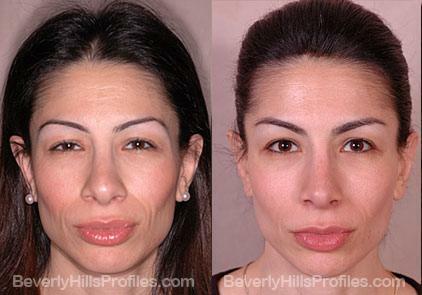 She wanted a much smaller, more feminine nose and preferred a slight slope. She’s thrilled that her new nose suits her so well and really softens her features. In these 4-year post-op photos, you can see that the results really stand the test of time.